A few years ago, the idea of controlling your lights or even security system remotely through your smartphone would have been deemed so futuristic and only present in the minds of science fiction novelists. Artificial intelligence might conjure images of the latest Sci-fi movie that you recently watched, yet in actual sense, its actual impact in our everyday life is more understated and far reaching than the science fiction movies and novels might actually suggest. Most of us have encountered AI in our everyday lives. Think about Netflix suggesting to you are a TV to watch. Google maps are already sourcing location data from our smartphone and aiding us with directions. On the other hand, should I just put it that if you are using a smartphone then you are interacting with AI, whether you know it or not. From aircraft autopilots to banking institutions, use of artificial intelligence is already hear with us. What remains to be seen is how long it will take AI to make our smart homes much smarter? Over the past years, LG has shown tremendous growth in the technology sector. 2018 has been an exciting year where they have unveiled their innovations when it comes to their products from smart phones, kitchen appliances, home appliances and the rest. 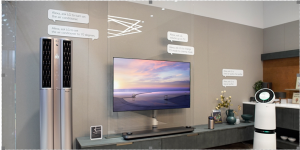 LG have taken up a challenge for 2019 that they will increase artificial intelligence, unique smart television displays and faster internet for their smart phones and devices. These are the things many LG consumers are looking forward to the coming year. It will increase the customer consumerism and strengthen the relationship they have already established with their loyal consumers. LG is not bound to disappoint. The New Year will bring about a fresh approach to old concepts something that we are all looking forward to. The application of artificial intelligence are here with us and are set to become more invasive in the coming year and in the future.